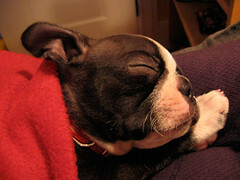 Snoozing Puppies » Blog Archive » it’s a bird. it’s a plane. no, it’s super dog! « can you pick up some shims at the store? This entry was posted on Friday, December 14th, 2007 at 5:55 pm	and is filed under Uncategorized, dreamy. You can follow any responses to this entry through the RSS 2.0 feed. You can leave a response, or trackback from your own site. surprises were around every coenrr. The evening before we arrived for disassembly my wife and I took a look to see if it was something we were interested in and given the extremely low asking price we were all in and wrote a check on the spot. By 9 the next morning, I was in utter panic at the condition of the structure we just bought. I am scheduling time this week to go to the hardware store to get the pieces we need new footers (old ones rotten to the core), new hardware (rusted to the point of breaking off during disassembly), new canopy, and new swing chains. All tolled, we’ll spend an additional $140.00 over what we paid, however after replacing these items and adding a nice coat of stain we will have saved hundreds, possibly a thousand +, on what we would’ve have spend on a new or mildly used one and it will look just as good. Wouldn’t have done it any other way. Thanks again for sharing.